THE WEEKEND CHEF – SAVORY CREPES & SWEET CREPES FOR DINNER (SERVES 6) | Crappy Kitchen - Good Dinners! You say CREPES, we say PANCAKES! 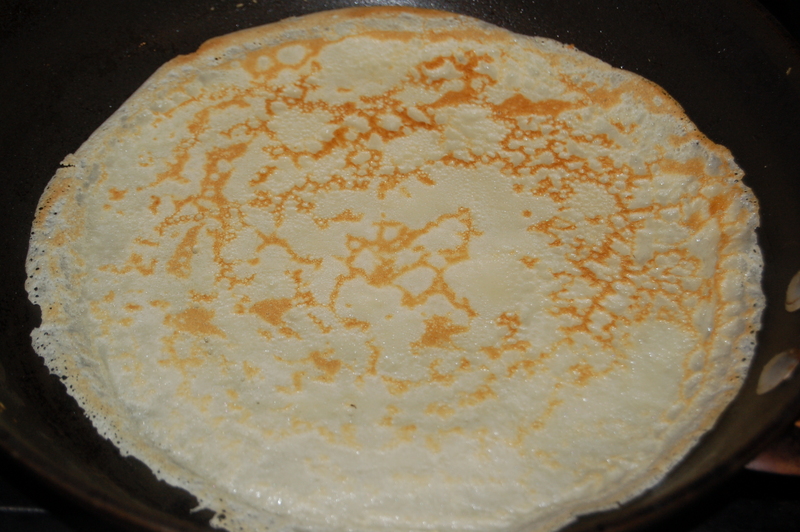 Yes, what American’s know as crepes, we called pancakes and we really only ate them on “Pancake Tuesday” This was the Tuesday before lent when there was 40 days of penitential observance ahead! This was a day in Ireland when every mother spent her evening doling out dozens of pancakes until bellies were fat and hunger was overly sated. Our weekend chef wanted to make it “Pancake Tuesday” this past Saturday, and there were no objections! My son has the full reign of my kitchen on Saturday night for the entire of 2014, and the rule is that I go along with whatever he wants to make. The only thing I told him to keep in mind is that he should really go for dishes where the basic recipe opens up a wide range of possibilities. This was a perfect example. 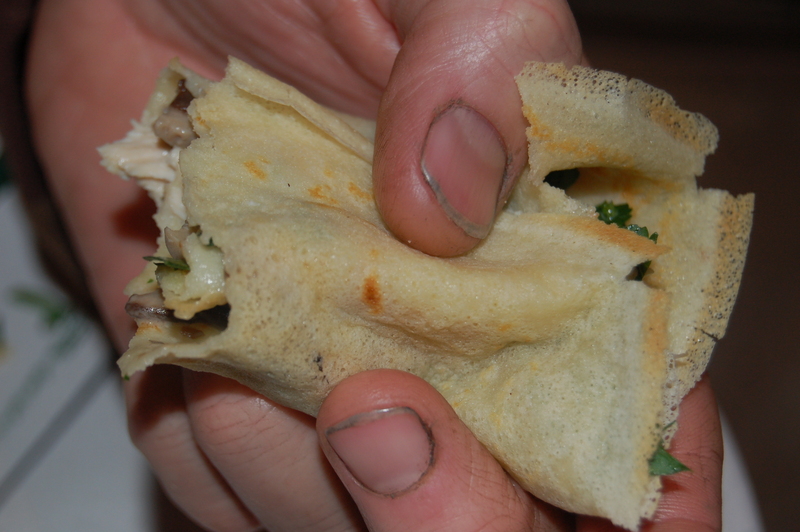 delicate crepes can be a manly dinner! 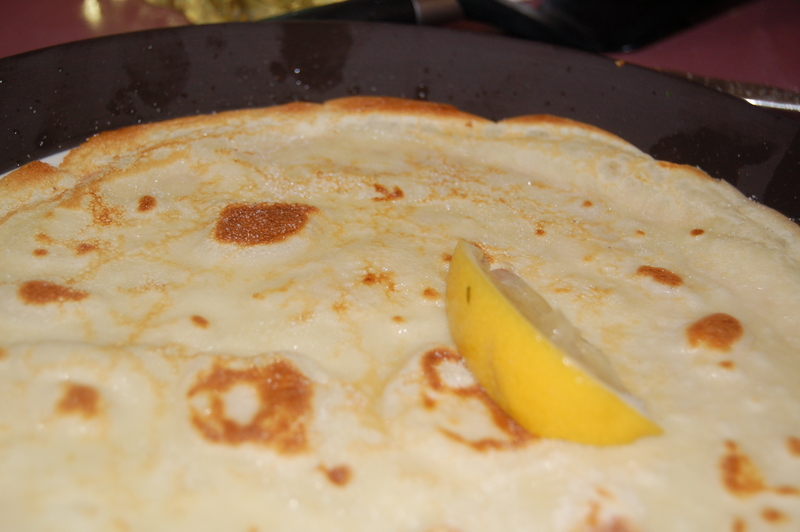 The crepe is the perfect crowd-pleaser as even the most opposing palates can be pleased at the same meal. This thin spongy and light fried batter can be filed with pretty much anything you like; from savory to sweet stuff. My son decided to go from savory to sweet with a mushroom cream filling for dinner (with the option of chicken for the ones of us who can’t live without meat! ), followed by berries in a cloud of fresh cream for dessert. All I can say is that this boy of mine will be a good catch! He couldn’t believe how easy it was to make the batter (so we have had crepes every morning since last weekend with a sprinkle of raw sugar and a squeeze of lemon juice). He now also knows how to make a mushroom cream, which is one of the most versatile sauces/condiments in the world. It can be served on its own like here, or thrown into any number of stews or casseroles as an enricher ( yep, a made-up word), or used as the backbone of a hearty lasagna or other pasta dishes. I haven’t even mentioned how much fun was had in the kitchen with everyone begging for crepes faster than he could make them and watching him get better and better with every flip of the spatula – a yummy Saturday night indeed! prep veggies – My son chopped an inordinate amount of mushrooms! 2 – Add the butter to a large saute pan and place over medium/high heat. 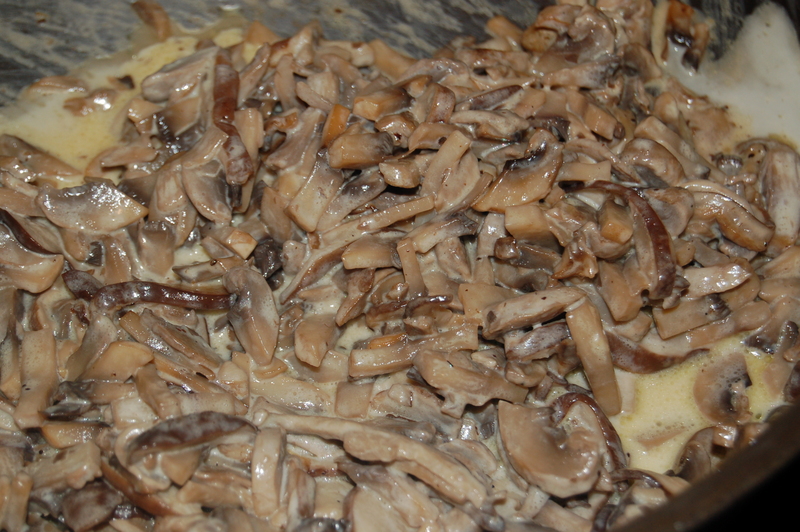 When it has melted, add the mushrooms and fry for 10 minutes. Turn heat up if they feel liquid-y. Place lid on pan and turn heat down and cook for a further 5 to 8 minutes until very soft. 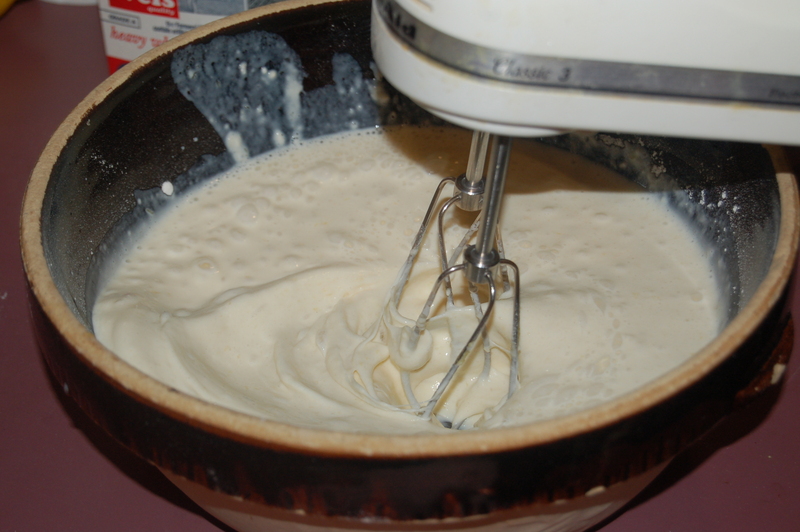 3 – Add the cream and turn heat up. Let it bubble, while stirring for about 3 minutes. Turn heat off and add salt and pepper to your taste and a squeeze of lemon juice. This will keep in the fridge for 5 days and is a handy thing to freeze! Put heavy pan on medium heat and lightly grease with oil (Use safflower, canola or veggie oil) Put 2 tbls of batter into pan and swirl around to coat the bottom of the pan in a thin-film of batter. Fry crepes for 2 to 3 minutes per side. Fill with whatever you like, from savory to sweet. 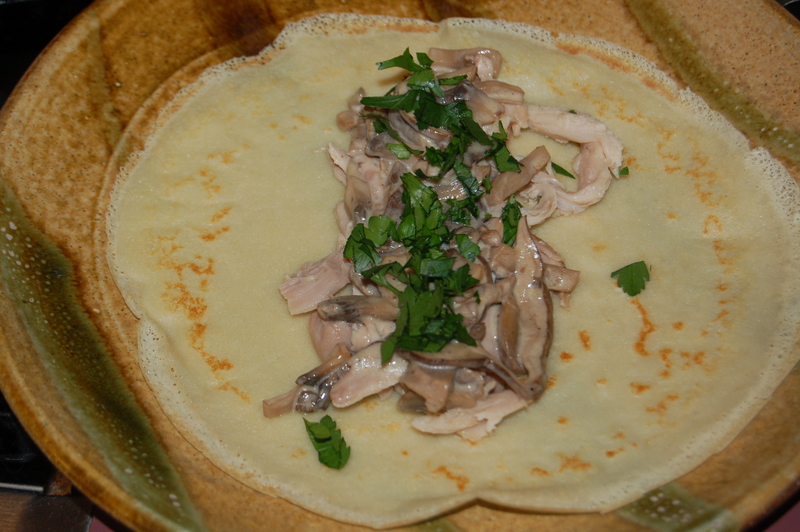 This entry was posted in dinners and tagged crepe, crepe with sugar and lemon, crepes, lemon, mushroom cream, mushroom filling, mushroom sauce, pancake tuesday, pancakes, savory crepe, shrove tuesday, sweet crepe. Bookmark the permalink.